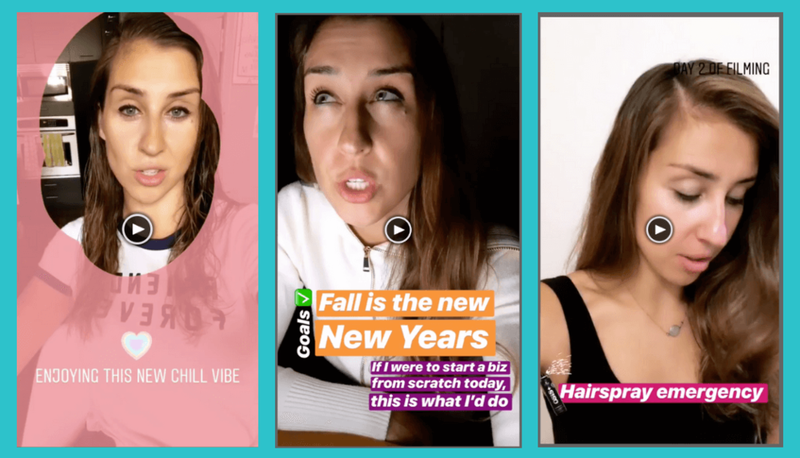 Instagram Stories are an absolute game changer for content creators and business owners. With over one billion active users on the app, it has become easier than ever (like, ever) to connect with your target audience and monetize your following. It’s the closest and easiest way to actually talk to my audience; it’s kind of like I’m climbing out of their phone (not in a creepy ‘The Ring’ way; in a totally casual way), sitting down on their couch and we’re just chattin’ like good friends about our businesses and lives. Your content is prioritized on their phone screens. Instead of having to scroll and scroll and scroll in their feeds to find your perfectly-styled and meticulously-planned new post, your Instagram Stories are right up there on the top of their newsfeed, ready to view and enjoy. You can share much more personal and casual content. Want to show the awesome pumpkin pasta you had for lunch? IG Stories. Had a funny behind-the-scenes fail? IG Stories. Having a tough work day, you’re so behind on your blog schedule and you’re trying to see if anyone else can #relate? IG Stories. P.S. you know what’s more interesting and relatable to your audience than a perfectly-styled Instagram post? Realness. Authenticity. Personality. Guess where you can show all of that? Say it with me: INSTAGRAM STORIES. That's why levelling up your Instagram Stories game is so important. It gives you the opportunity to unleash your inner creative and make your brand stand out. But you can't just rely on the in-app tools. If you want your followers to sit up and take notice, your content needs to look different. You'll score even more points if your Stories are on brand and help you create a consistent message across all platforms. So how do you actually go about doing that? Is your video too long to upload onto Instagram Stories? I’ve been there, friend. 15 seconds can really fly by when you’re trying to share a seriously good story with your followers. But no worries if you have a video that’s over 15 seconds. Cut it down into the perfect bite-sized chunks with CutStory. The app splits any long video you upload into 15-second increments. It's a life-saver if you're trying to record a video and can't get in everything you want to say before Instagram cuts you off. Instagram Update: If you're an Android user, Instagram has started rolling out a native video clip feature. It automatically cuts videos you upload or record into clips. When you're done recording, you can edit each one separately and remove any clips you don't want. I'm patiently waiting for this Instagram feature to come out for iOS users! Hype Type gives you video, music, and cute fonts all in one easy-to-use app. You can add animated text over your boomerangs or photos, grabbing your followers’ attention as they tap through your Stories. I love using this app for announcing new blog posts or new retreats. It adds something different and cuts through the noise, helping my content stand out on the ‘gram. The only thing that’s a bit annoying is the watermark. However, there is an option to pay a small fee to remove it, or you can use a sticker on Stories (I usually use the location sticker) to cover it up. 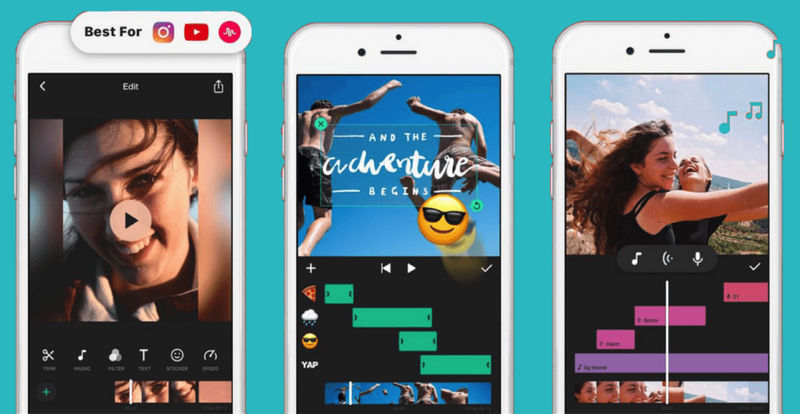 Looking for a great app to edit your video clips on the go? Download InShot. It’s a free mobile editing app that is packed with a ton of features. The editing options are ENDLESS. 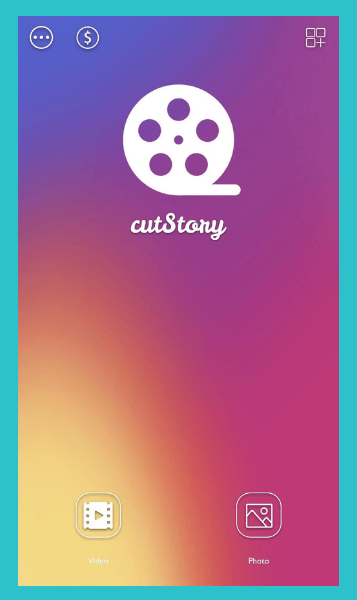 You can easily string clips together, adjust the speed for some cinematic slow-mo shots, and customize your videos with text overlays, music, filters, and voiceovers. BONUS: InShot also lets you easily convert videos into the necessary proportions for Instagram Stories. Say goodbye to those awkwardly zoomed-in pixelated shots! It’s one of the best Instagram Stories editing apps if you’re not ready to tackle advanced desktop editing programs like Adobe Premiere or Final Cut Pro. Tired of the same five font options that come with Instagram Stories? 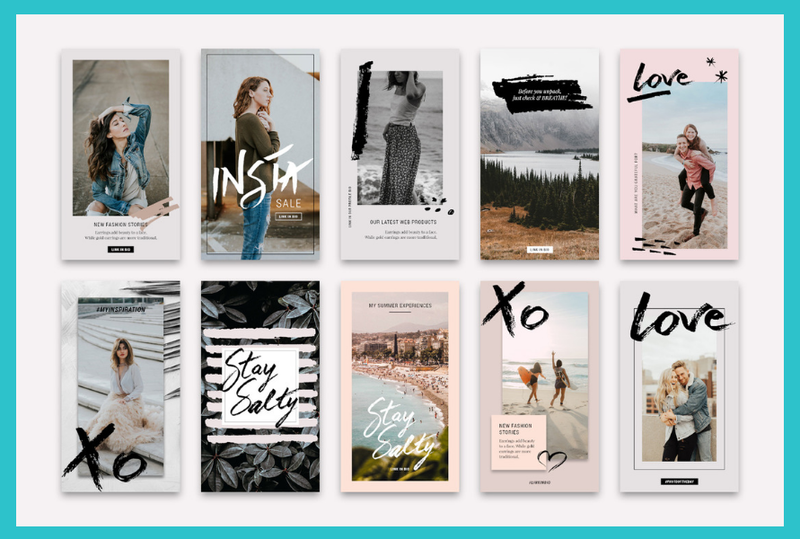 Level up your Insta game with Font Candy! It’s an app that comes with hundreds of font options (plus free stock photos) that give you the chance to let your true personality shine. There’s even the option to add artwork to your photos — and you can import in your own fonts! That’s really what sets this app apart from others for me. If you’re running a business, you want to keep all your brand messaging uniform. Font Candy gives you the tools to do this so you can train your followers to recognize your brand on any platform. The app has climbed to over 3 million active monthly users since it launched in January 2018. So what makes this app such a must-have? Unfold provides a series of modern, clean and super ‘in’ Instagram Story templates. You can then choose to add photos from your camera roll or stock imagery. You can even add beautiful text overlays to take your Instagram Stories to the next level. The app also comes with some of the most beautiful collages out there, making it easy to share two or more photos in the same Story. I also love having the option to add videos! It’s honestly one of the best apps available if you’re looking to curate your Stories with the same aesthetic as your feed. Canva is one of my all-time favorite free design apps. It gives everyone the chance to create beautiful, eye-catching imagery, even if you know nothing about design. For the last couple of months, I’ve been using it to create branded Instagram Stories. It has saved me SO much time and has taken the stress out of creating consistent on-brand content. For those of you that were asking how the Bali retreat Instagram Stories were made, the answer is CANVA. Yes - all these beauts were made in this amazing and free program. Or use one of Canva’s pre-made templates that you can customize to match your brand. Use any of these Canva templates to go from I-Know-Nothing-About-Design to I-Just-Made-This-Totally-Beautiful-Design in 0.1 second! Once you’re done, you can save the design to your account. The next time you login, you can simply click on the project and edit as needed. You can also use Canva to create beautiful Instagram Highlight covers. It's another easy way to add your branding to your profile with just a few clicks. I've also seen some travel bloggers go above and beyond and use the app to create visual travel guides - crazy cool! So, now you’ve got the tools. There are no more excuses. Time to brainstorm some unique ways to elevate your content visually, blow your followers out of the water, and leave them with no choice but to engage, engage, and engage with your content. Struggling to Monetize Your Business on Instagram? Let’s take the guessing out of mastering Instagram. Say goodbye to your algorithm troubles and start growing your account while making serious sales (Yeah, it’s 100% feasible!). Sign up for my totally free Instagram masterclass. I'll show you my top three tactics to gain 1,000 new and engaged followers in a measly 30 days.